I haven't been overrun with requests to review things but it does happen from time to time. The first instance was with an indie band. They'd noted a review I'd done of a Camera Obscura album and suggested I might like their music. Out of the kindness of my heart, I decided not to write a review of their... er, "music". As of late though I've decided I should be more open to reviewing something regardless of how I feel about it. No such thing as bad publicity (he said knowing full well he was stretching the term publicity to the limit when speaking in terms of his own site) so from now on I'll give honest reviews to anyone that wants it. 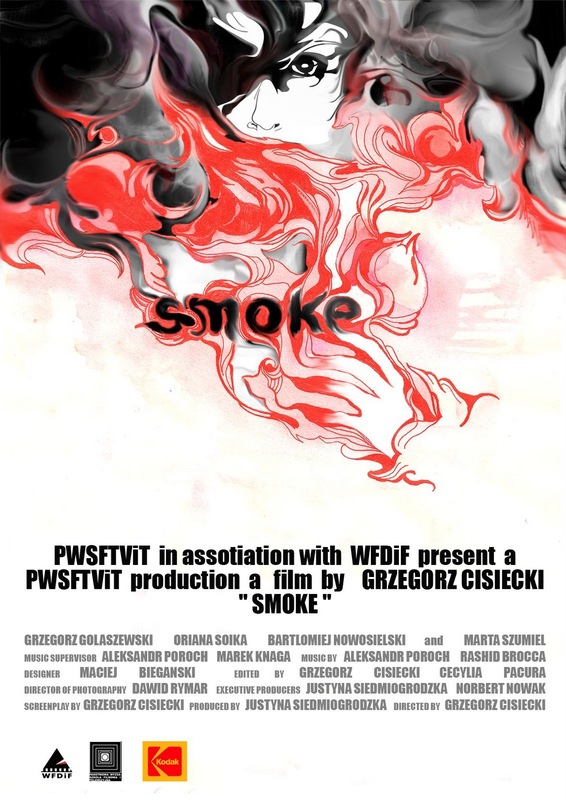 A couple days back I woke to find an email from a Russian filmmaker named Grzegorz Cisiecki asking me to review a short film of his which was posted on youtube. Included was the above artwork and links to his movie and title on IMDB. Naturally I checked the IMDB first out of curiosity. The only review for it was from someone pondering why they had been asked to review the movie. It was at that point that my heart warmed to the idea of watching it. First though, figuring he must have sent it out to every online film critic, I decided to see what others were saying. Sure enough I found other reviews that started with a description of an email out of the blue from Grzegorz (evidently, I don't speak Russian, if anyone knows how to pronounce his name I'm curious). I also saw that many seemed to feel that it was like he was channeling David Lynch. That just made me more interested in watching it, so setting aside a quiet moment to properly give it its due, I dove in. First thing I was struck by was that the film quality and the lighting were rich and overall well produced. Secondly, that it was making me laugh when I seriously doubted that was the intention. It's 7 minutes long and that's about five minutes more than I needed for what is a couple steps above a perfume ad. I understand the comparisons to Lynch, but as far as I'm concerned, just cause something's surreal doesn't make it Lynch. It feels like he's trying to mimic a few different European directors but doesn't really have their true creativity. I'll call a spade a spade and while Smoke isn't the worst short I've seen, it's just not a good film. It's striving to be something that's already been. In the end I couldn't help but feel that after the film was over I would receive a call informing me I had 7 days to live. I will say this in defense of the movie; that poster is pretty fantastic. You have 7 days to live. LOL! The 7 days to live part is hilarious! Glad CC picked up on it too! First of all I am choked that I am not the first choice of obscure Russian filmmakers when it comes to reviewing their stuff but I am proud and insanely jealous that you seemed to have reached a level of popularity...I guess. Second of all I now don't have to watch it because you said it sucked and I trust your opinion when it comes to what I would most likely enjoy. Even though you're not enthralled you piqued my interested enough to see...WAIT!!! What does Melvin say? The only review for it was from someone pondering why they had been asked to review the movie. It was at that point that my heart warmed to the idea of watching it. And finally, if you haven't seen "A Ninja Pays Half My Rent" it's a fun short. post production and finishing is great but the story was sub-par. Sounds like he wasn't able to captivate the required essence of the short film. I haven't personally seen it, but I think you've saved me the time! That is a kickass poster. And good post, kudos on your review. Never feel hesitant to critique someone when they honestly ask for it. Not everything can be great. If they don't like it, forget them, you're an awesome critic. Going to have to invest my time elsewhere, thanks for the review TS!